If the Chesapeake were a state, this would be its state bird. Unlike the herons in Florida, ours usually fly away if there are lots of people nearby, so we associate them with secluded places. They nest in communal rookeries in trees, including one near Nanjemoy Creek on the Potomac, and there may be a small rookery in the upper Magothy. They are here all winter, and sometimes make a weird croaking call, usually when taking off. They stalk fish and then stab them and you can see the bulge going down their necks. 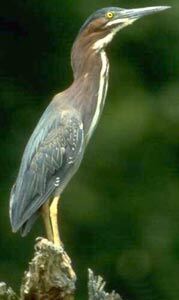 This much smaller heron (18″ long) may be called green heron (its old name) in some books. Its back is green-gray but its reddish breast may be more visible. You’ll see it skulking about in the snags at the shore of a small creek or cove. Its call is distinctive, written as skyow or kyowk. This is one of the most common winter gulls on the Chesapeake and the Magothy, with a dark ring at the tip of its bill, but is not here in the summer. 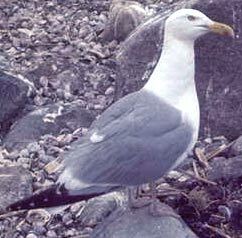 It’s about 1/3 smaller (17″ long) than the more familiar herring gull but has similar markings, except for the ring on the bill and yellow feet and legs. Takes 3 years to reach adult plumage migrates to the Arctic to breed. This gull is also common here in the winter, but is also seen here in the summer, and has nested on the Eastern Shore of the Chesapeake. At 25″ long it is larger than the ring-billed and laughing gulls, but smaller than the Great black-backed gull. Legs are pink, the head is white, the back is gray, and the beak is yellow, with a red dot on the bill at which the young peck when they want to be fed. These are less common than herring gulls on the Magothy; they are more common as you approach the ocean. The larger size (30″ long) and thicker bill distinguish them from herring gulls in all plumages, and the intensely black back in the adults is diagnostic (the other gulls with black backs donít occur here). They are here all year, although in the 1950’s they were only here in the winter. This is another common gull on the Chesapeake and the Magothy, but it is usually only here in the summer, and has nested on both the Western and Eastern shores of the Chesapeake. 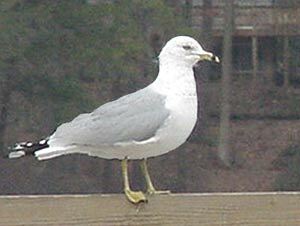 It is about the same size as a ring-billed gull, and is easily recognized by its black head in the breeding adults. In all plumages, look for the red bill and black legs and feet, and listen for the laughing call. Both are about 14″ long, and are very similar in appearance. When flying, Forster’s has paler wing tips (the Peterson field guide has a good comparison). Note the forked tail that is characteristic of terns. Breeding adults have a black cap, juvenile and winter plumage just has a black eye stripe, connected to a partial black cap on the back of the head in the Common tern. Summer birds of both species have red bills but Forster’s bill is more orange. Terns are only here during migration and in the summer. Little is the newer name, least is the older name. Much smaller (9″ long) and less common than Forster’s or Common Tern, with yellow beak, and more acrobatic, almost like a barn swallow. Has white patch or “forehead” at base of bill (you should be able to see this with binoculars when it perches on a pier). Call is a series of high-pitched “kip” notes. Seen in Magothy Narrows area and lower Cornfield Creek. Once only seen here in the spring and fall migration, they are becoming more common. The ones seen in summer may be non-breeders that didnít migrate. Large, black birds, they take off slowly with necks extended. 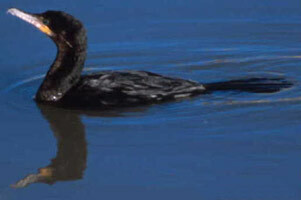 They are related to the Asian cormorants used to catch fish by putting a ring around their necks. This is the first bird in most bird books, because it is in one of the more primitive groups of birds. 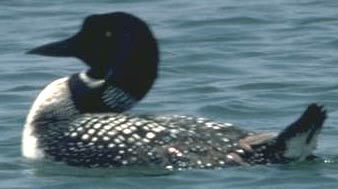 Their heavy bones make loons good divers (which is what the British call them). Uncommon in the Magothy, seen during spring and fall migration, usually in winter plumage (white throat). They winter along the Atlantic coast and breed in the Arctic. They sit fairly low in the water and may tilt their bill up, and dive frequently. One of the few shorebirds (other than Killdeer) seen regularly near the Magothy. 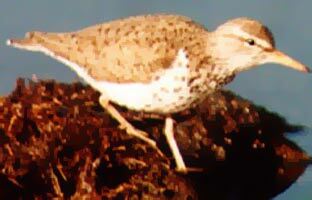 Look for it along the shoreline during spring migration, usually in May. It has a spotted breast, a bit like a wood thrush, and “teeters” as it walks. In some breeding areas in Minnesota this species is polyandrous: some females mate with more than one male in the same season. If the Magothy were a state, this would probably be our state bird. They winter in and near Venezuela and when the first ones arrive in late February or early March, their whistling calls and their broad wingspan are a sure sign of spring. Look for light feathers under the wings with dark “wrist” markings on the forward edge of the wing where it bends. 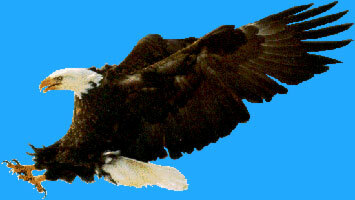 Wings slightly arched when soaring; those of the bald eagle are flat. They catch fish with their feet. Thank Rachel Carson’s memory when you see this bird, because if her 1962 book “Silent Spring” had not led to the banning of DDT in this country in 1973, they might be extinct due to eggshell thinning. These are much less common here than osprey, but they have been seen over the Magothy. 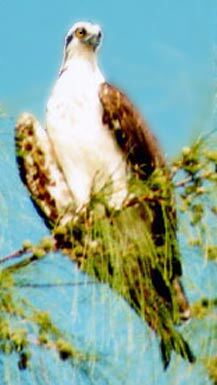 They are much larger and darker than an osprey, and soar with flat wings, but it’s hard to judge size. If in adult plumage the white head is diagnostic, but the immature plumages are less recognizable, and it takes them 4 to 5 years to reach full adult plumage. If you see one in the winter it couldn’t be an osprey. Eagles start nesting here in February. 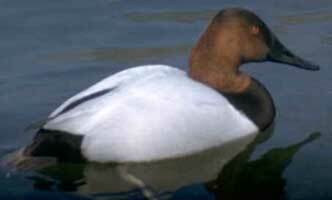 This shy, small duck is seen on secluded creeks and ponds in the winter. The bright white patch on the back of the male’s head resembles that of a hooded merganser, also seen here in the winter, but the merganser bill is longer and thinner. Once a favorite duck of Chesapeake hunters; now it is less abundant and less tasty. When the underwater Bay grasses declined in the 1970’s many canvasbacks started eating Baltic clams, which make the ducks less tasty. Usually seen in large “rafts” of several hundred birds out in the Bay in the winter, or in smaller numbers near the mouth of the Magothy. Once here only in the winter, now we have them all year. The summer or “resident” birds are descended from “decoy flocks” that were released in the 1930’s when they were made illegal. 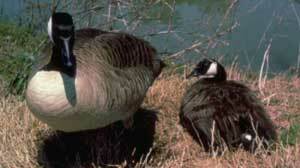 The decoy flocks were introduced races of Canada geese from the Midwest, and were wing clipped or pinioned so they couldn’t fly. They were very effective at attracting migratory geese, which were shot before they landed (to avoid shooting the decoys). Unfortunately the resident geese can be unpleasant neighbors, pulling up vegetation (including underwater grasses) and leaving droppings on your lawn. Their numbers have increased noticeably in recent years. 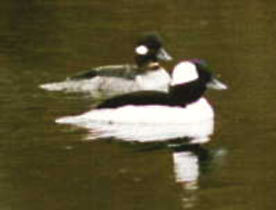 These are another resident and winter pair of waterfowl, except that they are different species. However, the resident bird (mute swan) is also considered invasive and a nuisance, like resident Canada geese. Mute swans have an orange bill and were introduced to Maryland in 1962. Their numbers went up about 40% from 1996 to 1999. 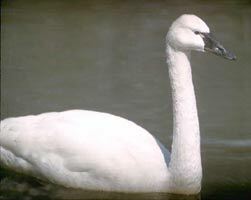 Tundra swans are only here in the winter, and have a black bill. They tend to be found fairly close to the Bay only. 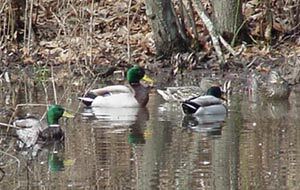 Most of the mallards on the Magothy are descended from captive-reared birds that were raised by Maryland DNR for hunting. The larger, darker ones are mostly captive-reared, and you also see some white domestic ducks, as well as hybrids. If this bird lived only near the water it would be called a “dock swallow” since it often nests under docks, and flies out over the water to catch insects. 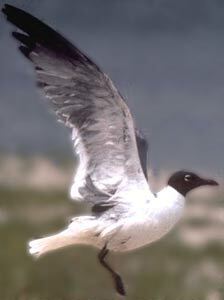 It has a forked tail like terns, and also migrates south in the winter. On Smith Island they are called shanty birds because they nest under the crab shanties at the ends of their docks. Did you know we have two different species of crow? They look almost identical, but they sound different. The American crow has a lower pitched, less nasal caw than the Fish crow. Unfortunately, an immature American crow sounds almost exactly like a Fish crow, so you can’t be sure once the young are out of the nest (late spring and summer). Fish crows are found only near the coast, usually near tidal waters. Crows were once mainly in the rural areas but have adapted to suburbia, learning how to rip open trash bags and other survival skills. 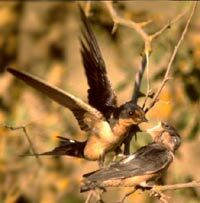 Both species nest here, and their nests are usually near the top of a large pine tree. This medium-sized blue-gray bird announces itself with a loud rattle, then swoops low over the water and lands on a branch over the water. Both sexes have a blue-gray breast band and the female also has a rust-colored belly band; in birds usually the male has more color. If you’re lucky, you may see it plunge dive into the water and catch a fish. It nests in a hole in a sandy bank and stays all winter. Otters if you would like a copy.